So last time you may remember I started talking about where I was after issue 1. I had found myself in the rather grateful position of some really wonderful feedback. Clients even said that they'd be happy to pay for future copies! This threw me for a moment I must confess, because as you read in my last post I hadn't considered this an option. Of course what I also hadn't considered was just how much extra I'd put into the first issue that I had never intended. You see the first issue was only supposed to be about 4-5 pages long... an easy freebie to put together, but packed with lots of great info. The problem was once I started writing I couldn't stop myself! So what do you do in this situation... one where people would consider paying and two, where you are finding you have spent a lot more time and effort on the freebie than you had planned? Well I started timing my efforts for issue 2. I'm going to be really succinct here, because I don't think you need to understand the intricate details of my writing process, but illustrating the timings I think is key. 1st draft (5h 16mins) - As you can imaging the first draft of writing is the hardest and takes the longest. It's where I write and eliminate, write and eliminate! It's also probably the most organic and creative of the processes listed here, because it's where I get to consider how this issue goes together and how it should flow. 1st layout (3h 30mins) - Here I'm working the written text into a magazine layout. This issue is much easier, because of course it's about adapting my layout from issue 1 and searching for images that will work with the text. 2nd layout (1h) - 2nd layouts are about tweaking for me. The content is there, it just needs to read well and look good. General hours (5hr 32mins) - Any marketing and social media I need to employ, or any behind the scenes admin is recorded in time here. So far that means I have spent 16 hours and 23 minutes on issue 2 and there's still plenty to do before it's release on August 1st. In issue 1 I probably spent double that in the end... there was a lot to learn. The other changes for issue 2 are that I am now producing an ecopy, a physical magazine and a printer friendly version for anyone who needs them... each requiring extra work on different layouts and templates. My initial thoughts were that this magazine would become a sales funnel for products and services, but the reality is that I don't think that is sustainable currently... especially as I'm offering so much more than I originally intended. I also think the adverts of products and services might actually be a turn off for clients. So my thoughts and those given to me by clients is that they'd rather pay for each issue and cut the adverts down to maybe just one. Between you and me this might actually work better because I have a new group Academy offering coming up soon that I think would be perfect and what's more could include each issue for free! In the light that one advert might not produce as many sales as I'd like, the time spent on each magazine/ezine issue really must be paid for, if I am to make this a part of my ongoing business... I simply have to get a trade off for the time, energy and intellectual property I create with each issue. I hate talking about money just like you do when it comes to your handmade products, but the reality is that if we want sustainable businesses we need to charge a reasonable wage for our time and reflect this in our products. After all why shouldn't we get paid for our hard work and expertise?! 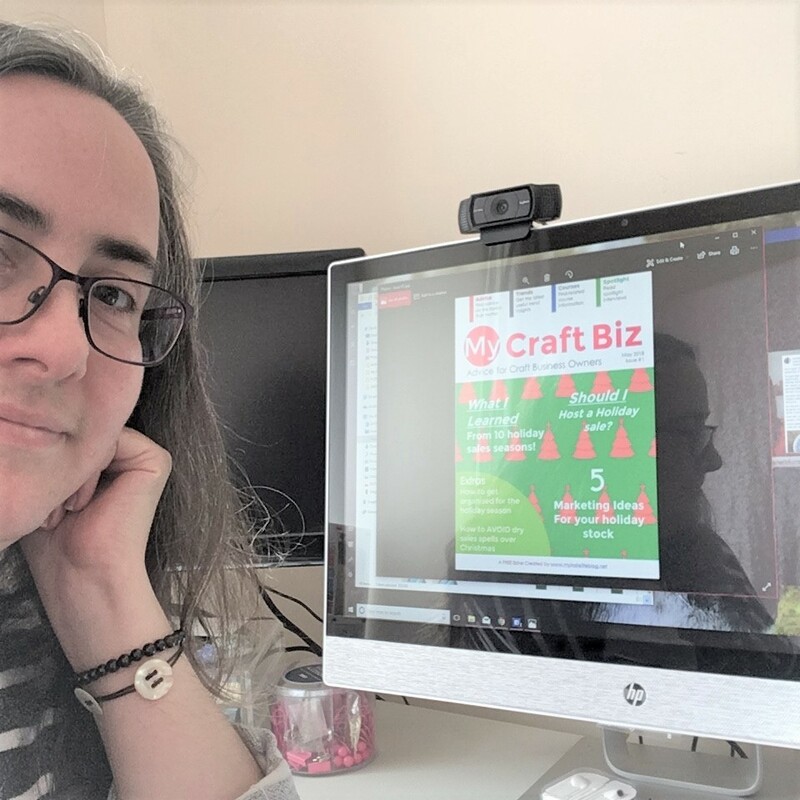 I charge £50 per hour + VAT to mentor a craft business and I break this down into £25/30 minute sessions to keep monthly subscriptions at a minimum. I'm also at my client's disposal if they need me during the month via email. This is a more than reasonable price for what you get from me and the experience you draw from... in fact most coaches in my industry charge around £65+ per hour, some well over £150. You see my point? Unless I charge for each issue, or make them vastly smaller this is not sustainable, unless with each issue I can upsell around £900-£1000 worth of products and services to break even. I cannot say I got any where near that after issue 1... of course with first issues and a small audience I wouldn't expect to, but I cannot yet see this as possible. So for now this means two things; I have to make some changes and start charging, or I'll have to rethink completely. Adverts will be down to just one per issue. Want to support me by buying a back issue? Handmade Business 001 - Welcome!